Alice Schmidt, 96, of Stratford, died Sunday, November 5, 2017 at Stratford Specialty Care. Memorial services will be held Thursday, November 9, 2017 at 2:00 p.m. at Stratford Lutheran Church with Pastor Joe Lambert officiating. Burial will be at Lawn Hill Cemetery, southeast of Stanhope. Visitation will be held one hour prior to the service at the church on Thursday. Alice Dorothea Bergman, daughter of John and Hulda Johansson Bergman, was born September 14, 1921 in Webster County. She attended Bellville County Schools and graduated from Stratford High School. She was united in marriage to Carl Schmidt on November 9, 1963 at the Stratford Evangelical Lutheran Church. The couple resided on their farm east of Stanhope. Carl passed away on June 23, 1984. 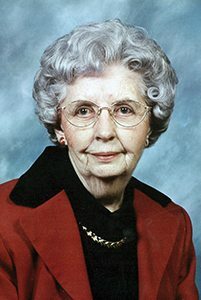 Alice worked for several years at the Lutheran Hospital in Fort Dodge until she was called home to care for her parents. She worked for 29 years at the Stratford Bank. She enjoyed traveling with Carl, gardening and reading. Alice is survived by nephews, Donald (Sharon) Peterson of Stratford, Gerald (Joyce) Peterson of Boone, John (Theresa) Peterson of Boone and niece, Carol (Jack) Nelson of Redfield. In addition to her parents, she was preceded in death by her husband, Carl; brother, Glenn (Delma) Bergman and sisters, Florence Iles and Violet Peterson. Alice was a member of Stratford LCMC and the Women of the ELCA. Memorials may be left to the Stratford Lutheran Church or Hospice of Central Iowa in memory of Alice.